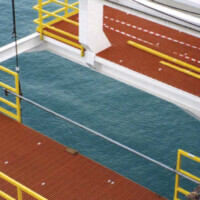 FRP (fiberglass reinforced plastic) has many applications across a number of industries. The ones that come to mind easily would be waste water or waste treatment, oil and gas and other utilities such as electricity distribution. One concern of customers who have not worked with FRP before is strength – how strong is it? That’s right – it isn’t well known that FRP is strong enough to be used as armor and has been for several years, even being used in the war in Iraq. How does it work? Specialized glass reinforcement is added to a proprietary resin formula in a matrix. When hit with a projectile the panels absorb the energy as they delaminate. In that way it is known as a composite armor. There are criterias for ballistics penetration set out by a couple of agencies including the Nation Institute of Justice (NIJ). Those familiar with this testing might say “Well, I bet Redco FRP can only meet the level 1 ballistic criteria?” which is the lowest on the scale. Not true – the panels can be produced to level 3A (or simply 3, depending on the scale) and can withstand the impact of a .44 magnum round. Don’t believe it? Click here for video. The applications for this are not as limited as you might think. For example, so-called “panic rooms” have become more popular in recent years and FRP composite armor would be ideally suited to this application. The material could also provide protection from courtrooms, to banks, to convieniance stores – essentially anywhere that might be threatened by firearms. In addition, the material is easy to work with. Ordinary carpentry tools would work but carbide tipped blades and drill bits are strongly recommended due to the abrasion the glass reinforcement applies to the tools.